A young man named Bob Dole from Russell, Kansas left home and fought in Italy during World War II, where he sustained wounds that required over three years of hospitalization. He fought off these crippling injuries, found a knack for politics, and rose to become the Senate’s Republican Leader. In 1996, he was nominated by his Party to become President of the United States. Senator Dole, now eighty-nine years old and in failing health, was escorted onto the Senate Chamber in a wheelchair by his wife, former Senator Elizabeth Dole (R–N.C. ), to observe a roll call vote in what once used to be called “The World’s Greatest Deliberative Body.” The vote was on whether to provide consent to ratify a United Nations Treaty to protect the rights of the disabled. The Treaty is modeled on the Americans with Disabilities Act. The conference committee report on this Act passed the Senate in 1990 by a vote of 91-6. The vote in the House of Representatives was 377-28. The Treaty is hortatory in nature. It calls on all nations to strive to provide the disabled the same rights as their fellow citizens. China and Russia have ratified this Treaty, along with 124 other countries. The arguments made in opposition to the Treaty were that it would empower faceless United Nations bureaucrats, interfere with home schooling of disabled children, and chip away at U.S. sovereignty. Some Senators also objected to voting on treaties during a lame duck session of Congress. 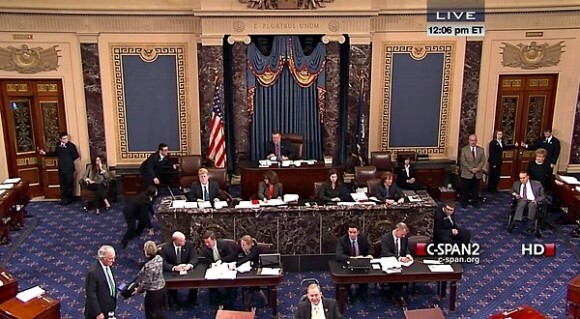 On the roll call vote, a total of eight Republican Senators voted “aye” — Ayotte (NH), Barrasso (WY), Brown (MA), Collins (ME), Lugar (IN), McCain (AZ), Murkowski (R-AK), and Snowe (ME). Of the eight, exactly one is up for re-election in 2014 — Senator Collins. The Treaty fell short of the necessary two-thirds majority required for the Senate’s consent to ratification by five Republican votes. Republican Senators, a bit thinner in number, will probably have another chance to vote on this Treaty in the new Congress. Indignation from the last vote was short-lived. My fellow U.S. citizens have turned their attention to other achingly sad news, a shooting rampage by a deranged young male directed against grade school children and their teachers. I presume that Sony has taken its television ads off the airwaves of adolescents diving about while playing hand-held video games of mass slaughter, at least for the remainder of the holiday season. How many of these mind-numbingly violent games will be under the Christmas tree? In due course, the Congress will be faced with votes on automatic weapons and ammunition clips that no true hunter would use. The results, at least in the House of Representatives, might be as dispiriting as the Senate vote on the Disabilities Treaty. In the meantime, in the spirit of the season and to promote family values, I propose two modest steps: First, regular hearings on Capitol Hill where corporate officers have to watch and explain their television commercials selling stylized violence in the form of video games. (Sample question: “Sir, what is the maximum number of action figures a person can kill playing this game?”) Second, as a modest public service, how about requiring studios and film distributors to include body counts in their advertisements for motion pictures? The Washington Post just published a story reporting on a large 10-country study that found little or no link between video games and gun murders at a macro level. (Link:http://www.washingtonpost.com/blogs/worldviews/wp/2012/12/17/ten-country-comparison-suggests-theres-little-or-no-link-between-video-games-and-gun-murders/). Until there is evidence that playing video video games causes violent behavior (rather than simply being correlated with it), there’s no reason anyone should expect that “regular hearings” in Congress on the marketing practices of firms that sell violent video games would be anything but a complete and utter waste of time and taxpayer money. The Post story is definitely worth reading. Isn’t there an important missing factor here? Maybe it’s missing because it is so hard to assess. How do you measure possible correlations between gun violence and national cultures? Are some cultural characteristics more readily influenced by violent video games than others? Why do the US shooters in these real life horror shows usually turn out to be young, maladjusted males? I’m obviously way out of my depth here. And I understand the dangers of stereotyping. But I cannot dismiss factors that relate to U.S. popular culture — in addition to the correlation between U.S. gun violence and the number of guns in the United States. Whether or not cultural factors apply, I still see value in public embarrassment of companies and corporate executives that promote violent video games. The psychological root of mass shootings is people who feel that they no longer have a reason to life and that they might as well exact a measure of revenge on their tormentors on the way out. They feel they have been wronged, abused, rejected, by the society they live in, they feel that nothing they do is going to change their situation, and so they choose to die, but also to try to inflict some of the pain they have been subjected to on the society that did it to them. Your average high school these days does not resemble the rest of our society. If you’re nnot one of the popular kids then you are considered a legitimate target for abuse, not only verbal, but physical and even sexual. if you report this to the powers that be, you can expect not only to be told “Oh, they’re just being kids, learn to ignore it”. I’m not sure how you just ignore being physically beaten, having your stuff stolen, having your clothes pulled off in public, but the staff certainly isn’t going to do anything about it. If you call the police to report the assault, they will just refer it back to the school. To add insult to injury, the victims of this sort of abuse are treated not as victims, but as potential shooters, making them even more outcast. Unlike in the working world, you can’t just change schools, they can and will force you to go back day after day for more and more abuse. Some kids in this situation find a way out by joining a a group or subculture or even a gang for protection. For others the only way out is through suicide. When you can’t stop the abuse and no one is willing to help you. then suicide starts to look like a very valid option. Others choose to die, but decide to take as many people with them as possible as revenge for all that they have been through, and for everyone else’s unwillingness to stop it. I could point to several excellent books on the phenomenon including the seminal Secret Service study that became the book Rampage. But I’m not. I lived through it, and while obviously I’ve never shot up a classroom full of people, I’ve certainly had many days where that seemed like a wonderful idea. While it’s not a cure-all to these sorts of mass shootings, turning the spotlight of publicity on the violence that is tolerated day in and day out in schools, when students who commit violent acts against other students are treated like criminals instead of given a pass is a good place to start. Not only are the First Person Shooter video games desensitizing our children to killing; while making them better at it; they are also a waste of their precious time. Instead of learning academic knowledge, these children are becoming better at monitor/gun coordination. For the average addicted child, I would imagine it is 1 hour per day, or 7 hours per week. It is also far from relaxing, it is stressful, as it requires perfect attention to complete a level. As long as glorifying violence will make a bigger bonus for some video game studio executive, we will have more violence. It is a mis-allocation of society’s scarce resources. I thought it was the comic books. I’m sure they told me it was the comic books. No, wait, it was the violence on television, yeah, that was it. That and the heavy-metal rock lyrics. So obviously the cause of the nation’s problems with crime and violence that we didn’t need to wait for actual evidence or proper scientific study, just trot out a few expertes from the right think tanks and proceed to the lynching. “In due course, the Congress will be faced with votes on automatic weapons and ammunition clips that no true hunter would use”. Is limiting an individual’s right enshrined in the US Constitution the issue or is this about the rights of ‘true hunters’? I own six guns, all inherited to me for the past 40 years. One could be considered a ‘sniper rifle’, since it is a bolt action .30 caliber. I also have rapid fire repeater rifles. Like millions of other Americans that own tens of millions of guns, not one of these weapons has ever walked out of my home and killed someone….and never will. Drunk drivers kill thousands of school children and thousands of adults every year, yet we hear no cries of these crazed acts of ‘car violence’ or denying the rights of law abiding citizens to own and drive cars.